The above info came from Rosanne Thompson, and was edited by yours truly (contact me). The image came from Amazon.com. The story begins with a normal girl living in Japan named Nakajima Yoko. She is confronted by Keiki, a Kirin that chooses the ruler of a kingdom. Given the sword Suiguu that only the King of Kei can wield, Nakajima and her two friends Asano and Sugimoto are taken to the Twelve Kingdoms and become hated Kaikyaku (someone taken through a Shoku from Japan to the Kingdoms). After being separated from her friends in battle by the King of Ko, Nakajima is told to go to the King of En, and with the help of the sword Suiguu and a Hanju (half beast) named Rakushun she starts on her way to En, the King of Ko making her fight to win her throne. 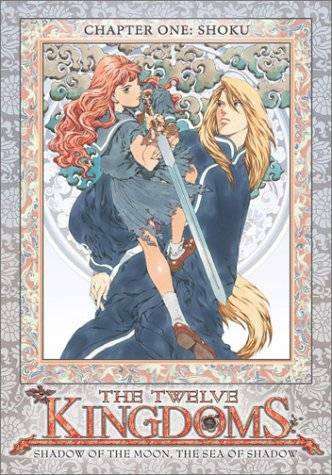 Twelve Kingdoms is an incomplete anime series. It is based on a series of novels by Fuyumi Ono, and that the anime was halted due to the company waiting for Fuyumi Ono to release additional novels. The above description came from Rosanne Thompson, and was edited by yours truly (contact me).